What has to happen for you to stop and reflect? A health crisis? Loss of relationship? Discover the compelling forces behind all of this activity. What are the gains in using busyness to avoid the fears of living passionately? Yes! there are also gains. Without blame or judgment, my work shows you how to get off this treadmill. Laura uses the wisdom of personal experience and her years of professional know how to be a compassionate and understanding guide as she reaches out to share what works. My busyness was like a band aid over a deep crevasse. 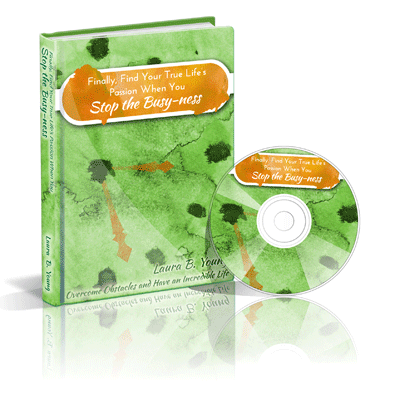 When I read Laura’s book on busyness, did the exercises in the workbook section, and listened to her audio, it gave me a clear step by step way out of the confusion and the frantic way I was living. If you are stuck in busyness, don’t overlook this work. I am actually getting more done these days without the frantic ways. or visit me on social media.